The Daiwa Gold Series GS9 dates back to the mid-seventies. If you shop around you can still buy them brand new. The GS9 is one of the few items from Daiwa to have had such a long life. This company are well known for constantly bringing out new spinning reel models. The Daiwa GS9 obviously sold very well over three decades or they would have stopped making it! Many slightly older surfcasters will know this reel well. Its greatest strength is its rugged reliability. That is just what you want from a surfcasting reel. Especially if you are fishing some distant deserted spot on holiday far from a supply of spare parts. Though these too are readily available. This model is made almost entirely of cast alloy and other metals. This is rare today. The Daiwa Gold Series GS9 spins quite freely on its two ball bearings. The reel makes a reassuring audible noise from the anti-reverse ratchet when the handle is turned. Fishing reels made today no longer make this sound. The gear ratio is 3.3:1. Again modern reels of this size would tend to have a slightly faster retrieve rate. However, you cannot really tell the difference when fishing. The lower gear ratio gives a slightly more powerful retrieve. The lower gear ratio also means the GS9’s pinion gear can take more punishment. 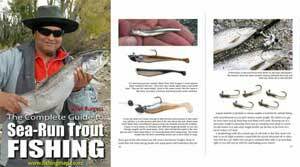 Line capacity is 275 yards of 20 pound, and 225 yards of 30 pound monofilament. This is plenty of line for surfcasting. If you are mainly concerned with casting distance the way to go is to spool up with twenty pound mono, then top-shot with a couple of rod lengths of 30 or 40 pound to act as a shock leader particularly if casting heavier sinker weights. For many years I have spool my surfcasting reels with 30 pound mono because I mostly fish shingle beaches and the heavier line better resisted the crushing action from the stones. Always remember that heavier line particularly on an “eggbeater” like the Daiwa GS9 is going to reduce casting distance caused by friction as the line peels up over the lip on the spool. Always keep your reel spool fully loaded to within a couple of millimeters of the top fro the same reason. The reel weighs 790g which balances well with a heavy surf rod. 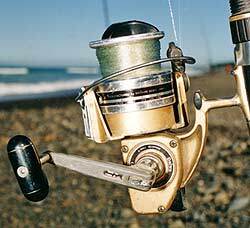 Overall the Daiwa Gold Series GS9 was, and still is, one of the toughest surfcasting reels ever made. The Daiwa Gold Series GS9 dates back to the mid-seventies. If you shop around you can still find them brand new. The GS9 is one of the few items from Daiwa to have had such a long life. Unlike more modern reels the GS is made largely from aluminum. Here is the New Zealand website for Daiwa surfcasting reels if you are looking for a quality modern Daiwa surf reel.